Back in London, we can always rely on the good old English full breakfast. Sausages, bacon, beans, mushrooms, hash browns, toast and lashings of butter all washed down with a mug of builders finest. Over in New York, they turn their noses up at such delights and instead opt for Brunch. Eaten slightly later (normally between 11 and 1), we are talking pancakes, thin strips of streaky bacon, eggs any and every way, all washed down with as much filter coffee as is humanly possible. No nonsense. 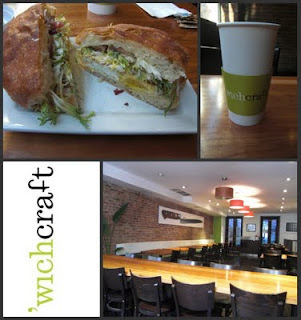 Wichcraft is essentially a chain of upmarket sandwich shops scattered across New York. Created by the same man who runs the chain of Craft restaurants, a fine pedigree in itself, the order of the day is sandwiches with a bit more thought and execution than your everyday Pret. They serve mainly to a lunch crowd but have a range of sandwiches to cater for the brunch crowd. I went for what was called "Fried Eggs" which contained bacon and Gorgonzola alongside the aforementioned eggs. I even picked up a slight warming chilli kick, a nice if unexpected touch. All washed down with a decent coffee, a great little place to drop by if you're on the go and in need of nourishment. When asking for New York dining recommendations, one place that is never far from most peoples thoughts is the Clinton Street Baking company. 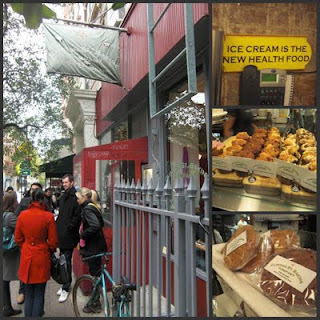 Located on the Lower East side, it's not exactly near all the other local tourist haunts but is certainly worth the detour. Famous for their pancakes, unless you arrive the minute they open, you are in for a wait. I was there around half ten and was told a 45 minute wait would ensue. 10 minutes later, wave upon wave bustled their way through the front door, only to be told they would have to brave the elements once again as the wait had now increased to an hour and a half. Inside, it's tiny. People are seated wherever there is space, be it near to the coffee machine, at the window or in the actual "dining room". 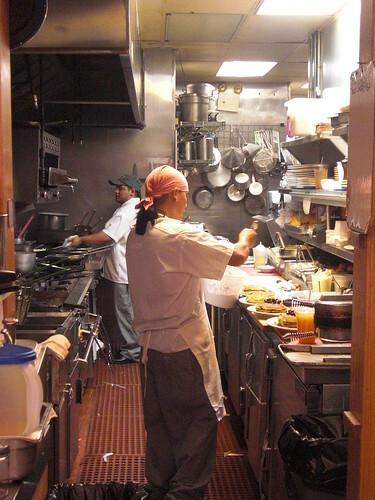 Even so, the atmosphere is jovial and the service efficient and with a smile. I think the promise of a good feed helps, but I happily passed the time with a coffee and stared into the kitchen, mesmerised as the brigade of chefs produced dish after yummy looking dish. Eventually, it was my turn and I took my seat at the "bar" and ordered. 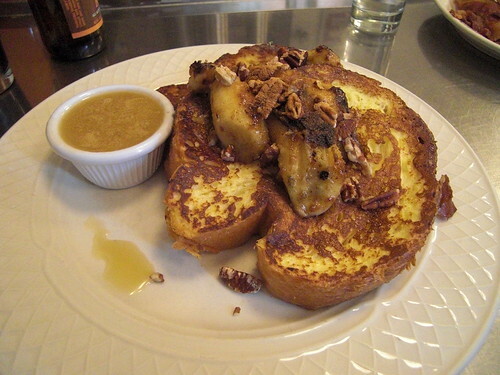 I went for the French Toast Brioche with Pecan and Caramelised bananas, and as if that wasn't enough, I ordered a side of smoked bacon. I know I should have got the pancakes but enough has been said about them and I wanted to try something different. And the french toast was fantastic. Delicate brioche dipped in egg and fried, the toast still moist and soft but certainly not soggy. The caramelised bananas added a nice sweetness and the pecans crunch. 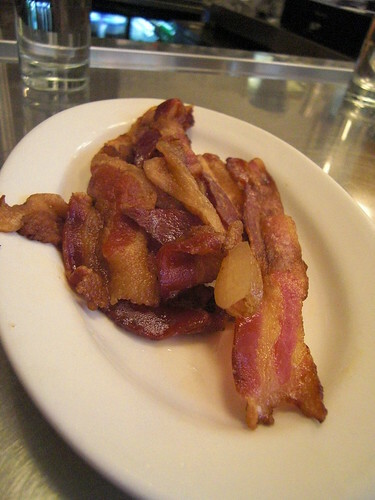 Bacon was crisp, smoky and not greasy, a winning combination. Clinton Street Bakery certainly had a lot to live up to, and even with a 45 minute wait, I actually enjoyed every minute of it. If anything, the wait just built up my hunger and I demolished my food the minute it arrived. Worth the trek and don't be surprised if you're there a while. 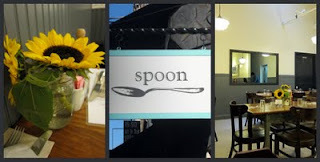 Conveniently located on the ground floor of where I was staying, Spoon is a relative new comer to the Brunch stakes. Originally opened as a catering outfit, it serves coffee and sandwiches during the week and opens its doors to the Brunch crowd at the weekends. Family friendly, a rarity in New York it seems, it was packed to the gills with well behaved and well dressed young children. I went with my cousin and her one and a bit year old who proceeded to cause a ruckus, throwing veggies heavenwards whenever possible, only to generate coo's of forgiveness from the adults around her just by pulling adorable faces. The brunch menu is limited but irresistible. I wanted to eat everything. Pancakes were on there as standard, in both blueberry and chocolate versions, but I wanted something more savoury and went for the baked eggs. This was like baked eggs deluxe. 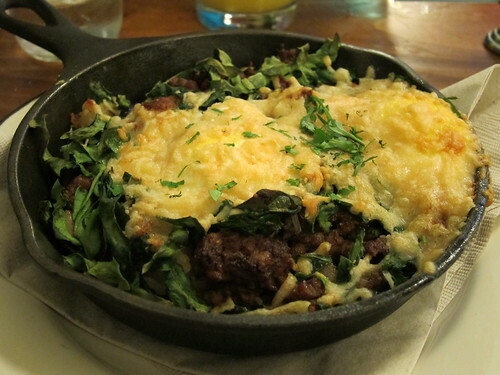 Alongside the two baked eggs was sausage meat, spinach, mushrooms, they even managed to pack a hash brown in there. It was topped off with a Parmesan crust and was a very hearty brunch. Lucky that, as it was the only thing I ate before I boarded my flight back to blighty. A fitting end to a rather OTT feasting trip. Rumour has it that Lucy Liu is a local and often comes to Spoon for brunch. I didn't spot her this time, but the next time I am back in New York, I may well be camped in Spoon on the look out. Clinton Street Bakery is just delish. I went there last year and somehow we managed to queue jump and get a seat within 5 minutes, to the fury of the people around us. The New Yorker we were with shrugged and said: 'Hey, this is New York. You do what you gotta do.' I did the blueberry pancakes. Gorgeous. I looove brunch. How have I not been to NYC yet? !